In some ways, the less you know about Just Theater’s latest show, the better. Here’s what you need to know and then you can read the rest after you’ve seen it: this is a very modern show in that it deconstructs and wrestles to the ground ideas of traditional theater. It deals with heavy subject matter (genocide) but does so with intelligence, humor and a wildly energetic style that moves well beyond the usual, polite play-audience interaction and more into the visceral punch-in-the-gut territory that leaves you slightly dazed in its aftermath. This is a play (well written and astonishingly well performed to be sure) but it’s also an EXPERIENCE. In other words, you should go. You aren’t likely to see anything like it, and in addition to seeing some great local actors being great, you’ll also have something on which to muse for a good while afterward. This show (presented in association with Shotgun Players knocks you for all kinds of loops. Not unlike Christopher Chen’s Hundred Flowers Project (read more here), Jackie Sibblies Drury’s (take a deep breath) We Are Proud to Present a Presentation About the Herero of Namibia, Formerly Known as Southwest Africa, from the German Südwestafrika, Between the Years 1884-1915 is a piece of theater within a piece of theater (a presentation within a presentation) that uses the making of theater to convey facts about history and to stir up deep emotions that quickly – and powerfully – make the pretend real. It’s hard to say how literal we are to take the premise here, but we begin in a rough performance space (the configuration of the space is just as it was for Shotgun’s Our Town, which is to say there are audience members on two sides of the space and no real set to speak of other than a table, chairs and a rolling ladder). There are six theater makers who address the audience with a rehearsed overview to give us some historical context. We are going to be dealing with Namibia in southwestern Africa. More specifically we will see how the German colonialists dealt with the native tribes, specifically the cow-herding Herero. By the time the Germans were ousted by the English in 1915, the Germans had exterminated most of the Herero. The idea is that the actors will read the only first-hand accounts of the German occupation, which are letters sent home by German soldiers. Apparently it’s an open rehearsal process with an audience, but that may be where the whole literal thing can be taken too far. 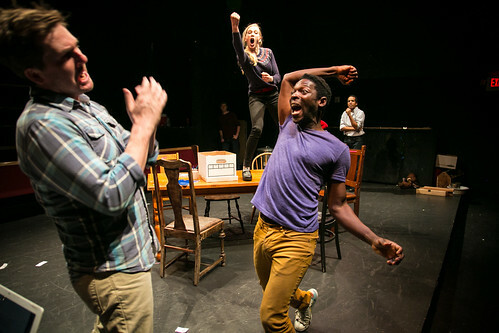 Through improv exercises and need to “create something real,” the actors – three black, three white – wrestle with one another and their director (Kehinde Koyejo, whose character is known only as Black Woman). They don’t know exactly what they’re doing or what they want to create, but they edge closer and closer to that something real until it’s too real and it’s not about the Herero and Germans at all. At first there’s a lot of recognizable actor angst – insecurity, ego, varying improv skills – but then the tension begins to become more specific. Is this story about the Germans? Or is it about the Herero? Is it about genocide? Or is it about something more personal and perhaps closer to home? At only 95 minutes, We Are Proud to Present… condenses a traumatic human experience (historical and personal) into a manageable time frame but does so with extraordinary attention to detail. The cast, which also includes Lucas Hatton, David Moore, Patrick Kelly Jones, Rotimi Agbabiaka and Megan Trout, has to create a believable contrast between “the play/presentation” and “real life,” and they do so beautifully under the direction of Molly Aaronson-Gelb. That contrast, so stark at the start, blurs more and more as this “rehearsal/workshop/whatever” continues, and by the end, art and reality, past and present, fact and emotion, are all in play in the most head-spinning way imaginable. My only complaint about Drury’s play is its speed. These are intelligent, emotional people working out some complicated stuff, and the 90-minute framework stifles what could be some even more interesting arguments about what’s really going on here. Interesting points are raised, debated and then quickly subdued while the show barrels on when it seems the really juicy arguments are just beginning. But wishing a smart, loud, aggressive play were even smarter, louder and more aggressive seems a little bratty when what’s here is so interesting, so physically adroit and, in the end, so moving. If you let this play take hold of you – and that’s easily accomplished – you won’t feel like the same person who walked into the theater. 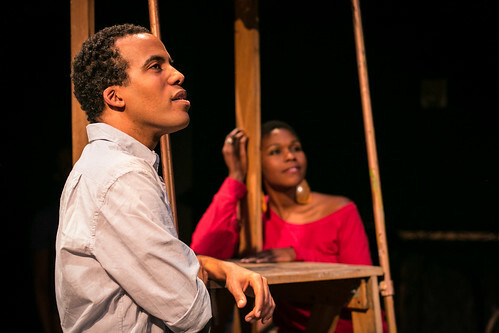 Jackie Sibblies Drury’s We Are Proud to Present… continues through March 7 at the Ashby Stage (in association with Shotgun Players), 1901 Ashby Ave., Berkeley. Tickets are $20-$25. Call 510-214-3780 or visit www.justtheater.org.